I know – what?! Well, it’s not April Fool’s Day and CBR and Newsarama are reporting it. The rather boring press release below doesn’t really reveal a lot, but I think it’s a good thing, as long as Joe Quesada still remains in charge and X-Men won’t be filled with princesses and singing animals. I’m sure Marvel will have plenty to say about this in the coming days, and I can already sense fanboys in a spin. The loose link is that Disney characters have been in comics for decades, and Mickey Mouse and pals are now being published by BOOM! Studios, and they’re making the Surrogates film based on the Top Shelf comic. Still – wow. DC Comics is owned by Warner Bros. and now this. 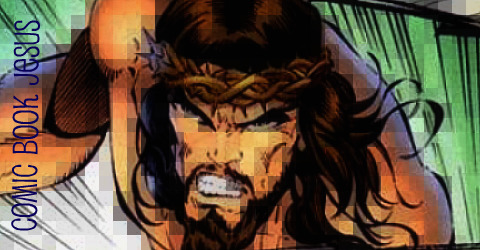 The two largest English speaking comic book publishers on the planet are now owned by multi-national corporations. Is that a good thing? Check out Disney CEO Robert A. Iger’s official video announcement here. Acquisition highlights Disney’s strategic focus on quality branded content, technological innovation and international expansion to build long-term shareholder value. Building on its strategy of delivering quality branded content to people around the world, The Walt DisneyCompany (DIS) has agreed to acquire Marvel Entertainment, Inc. (MVL) in a stock and cash transaction, the companies announced today. 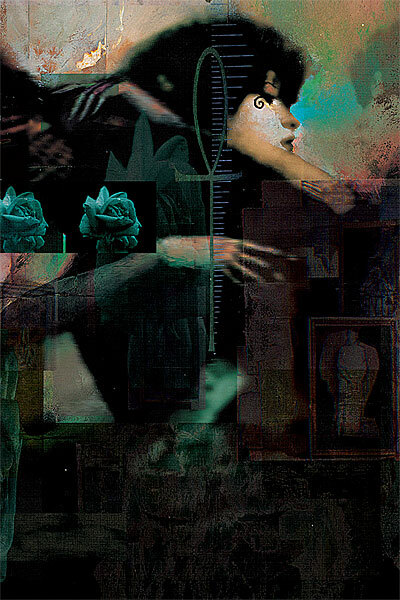 On sale October 14 from Vertigo is The Absolute Death – a 360 page oversized, slipcase hardcover for $99 collecting, well a bunch of stuff starring the popular Neil Gaiman character. Here’s all the info you need to know, plus Jeff Smith and Adam Hughes pin-ups from the gallery included in the hefty book. 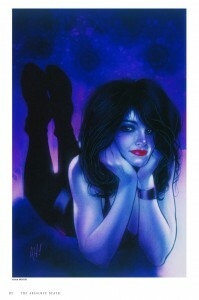 From the pages of Newbery Medal winner Neil Gaiman’s THE SANDMAN comes the young, pale, perky, fan-favorite character Death in a new Absolute Edition collecting her solo adventures! Featuring the miniseries DEATH: THE HIGH COST OF LIVING #1-3 in which Death befriends a teenager and helps a 250-year old homeless woman find her missing heart. Also included is the DEATH: THE TIME OF YOUR LIFE 3-issue miniseries featuring the story of a rising star in the music world wrestling with revealing her true sexual orientation just as her lover is lured into Death’s imminent realm. And enjoy a plethora of extras including the DEATH TALKS ABOUT LIFE AIDS pamphlet, stories from VERTIGO: WINTER’S EDGE #2 and THE SANDMAN: ENDLESS NIGHTS, the short story “The Wheel” from the 9-11 tribute book, SANDMAN #8 and #20 and extras from the DEATH GALLERY one-shot along with an intro from Amanda Palmer, the lead singer of the hit musical group The Dresden Dolls! It’s all combined right here for the first time in one volume. This Absolute Edition slipcased hardcover is also the perfect companion for THE ABSOLUTE SANDMAN and ideal for fans of Gaiman’s sprawling, intimate comics work! Marvel have some of the stupidest super villains ever, and they know it, and sometimes embrace it. 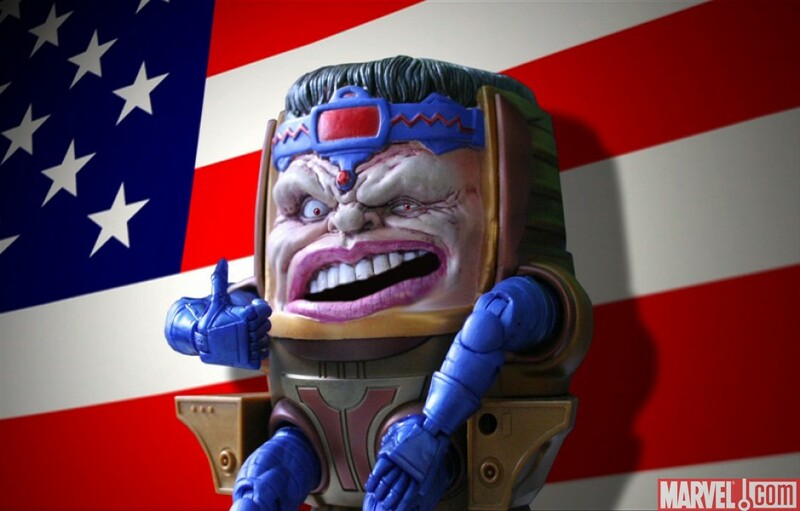 In the latest episode of the new Marvel Super Heroes “live action” web series, baddie MODOK reveals his entertaining past. His name is an acronym for Mobile Organism Designed Only For Killing and is a huge head in a floating chair. What’s not to love? Here’s the official skinny and some pics that would make nifty screen savers. 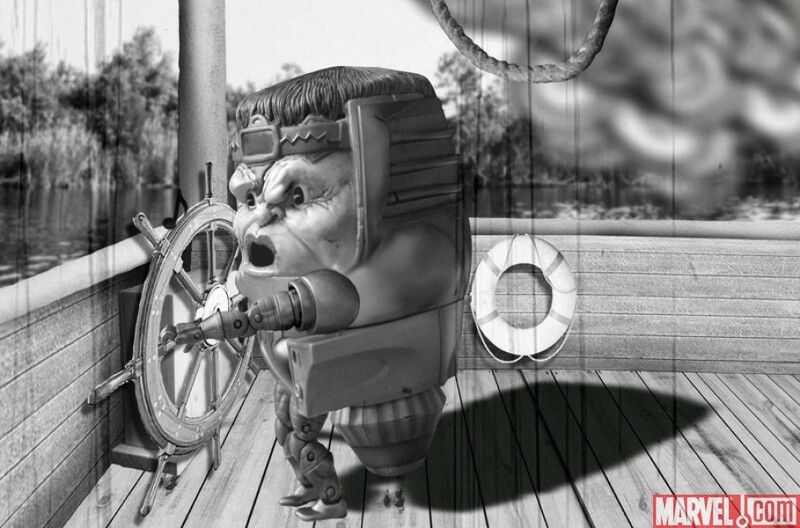 It’s a very special episode of Marvel Super Heroes: What The–?! 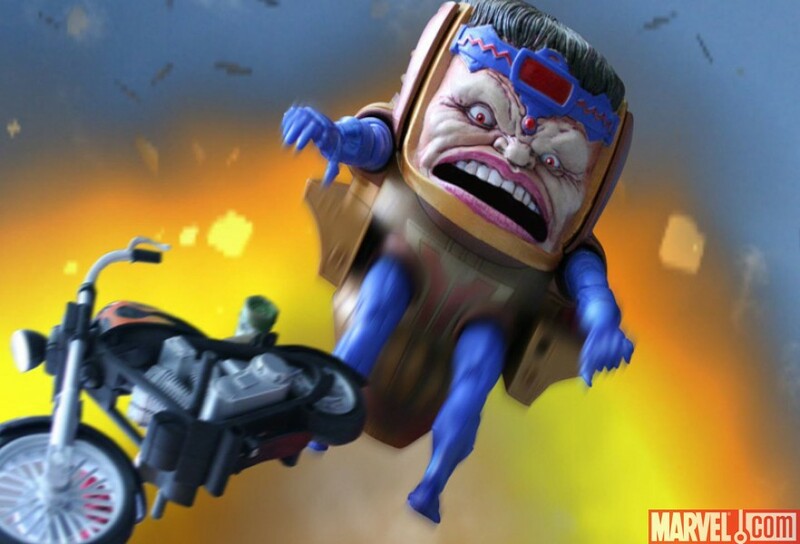 as we look back at the man, the myth, the giant head: M.O.D.O.K. 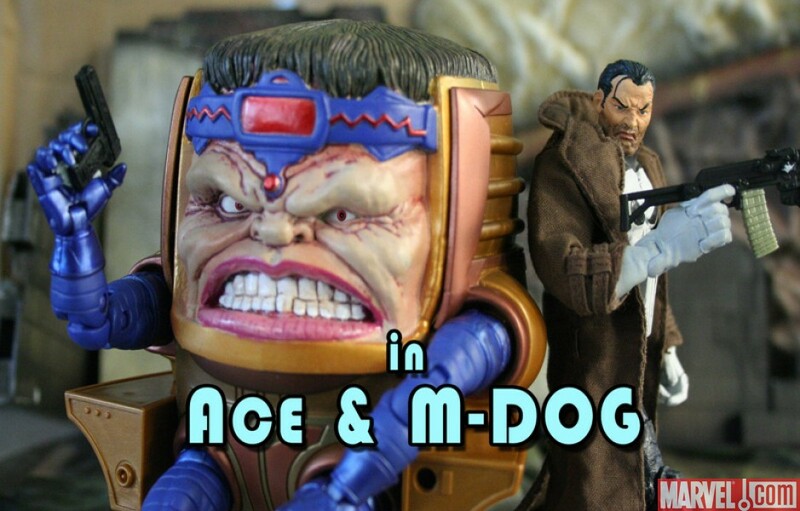 From his timeless black and white debut to his hilarious game show appearances and star turn as a 70s action hero, we remember M.O.D.O.K.’s most memorable moments! Check it out here. What, you’ve never heard of any of this stuff? Well then you better watch this one! Captain America, Deadpool, the Punisher and many more guest star in this brand new Marvel.com video presentation of “Marvel Super Heroes: What The–? !” Plus, hear the vocal talents of X MEN NOIR artist extraordinaire Dennis Calero—as the Leader! If you’ve seen the excellent Green Lantern: First Flight animated film, you’ve already seen this, but now the Superman/Batman: Public Enemies site has been updated with this First Look at the team-up movie. Based on the first few issues of the Jeph Loeb and Ed McGuiness series, with Lex Luthor as President and more guest stars than a season’s worth of Justice League Unlimited, this is going to be one awesome movie. Check out the almost 8 minute sneak peek below, with interviews from the cast and lots of perty pics from the comics and the film, which is released on September 29. 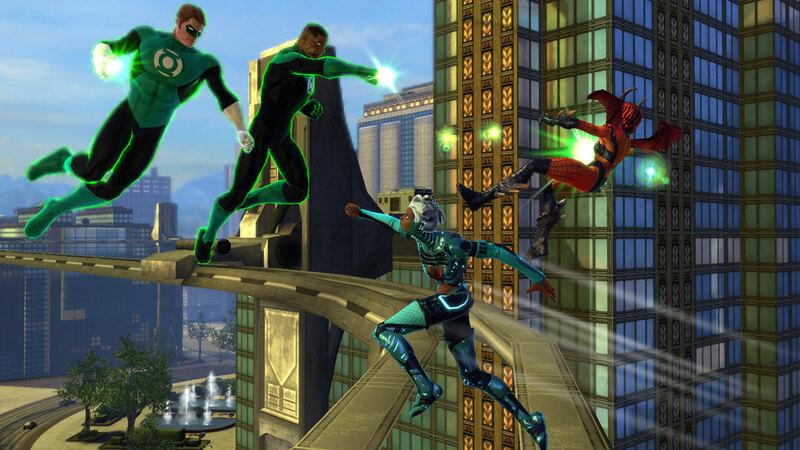 And still on DC-related news, the upcoming season 9 of Smallville not only has Zod, Metallo and a Geoff Johns-penned JSA episode, it also will introduce Green Arrow’s sidekick Speedy. 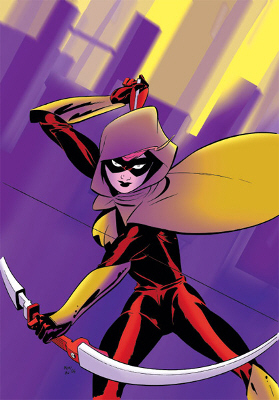 Not the Roy Harper version who grows up to become Red Arrow, but rather the Kevin Smith and Phil Hester created HIV-positive female teen, Mia Dearden. Green Arrow in Smallville is already quite young, but I guess you’re never young enough to have a younger apprentice. I can’t recall the last time I was this sad at the end of a series. 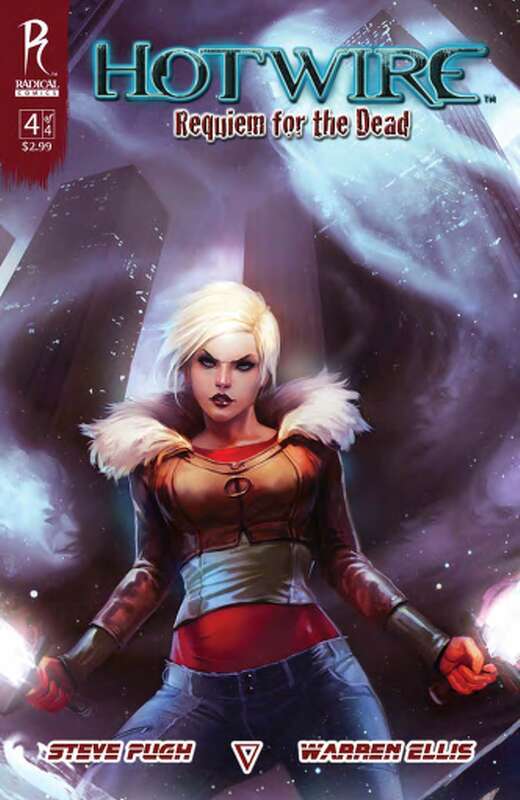 Not because it’s a disappointing end, but because Alice Hotwire’s standout adventures are now over. Steve Pugh has consistently delivered high quality entertainment over the four issues of this unique series from Radical Publishing and though I hope to see more, I’m also aware that it probably won’t be anytime soon. One look at any page and you’ll see why – it takes a lot of time to make pages like this. 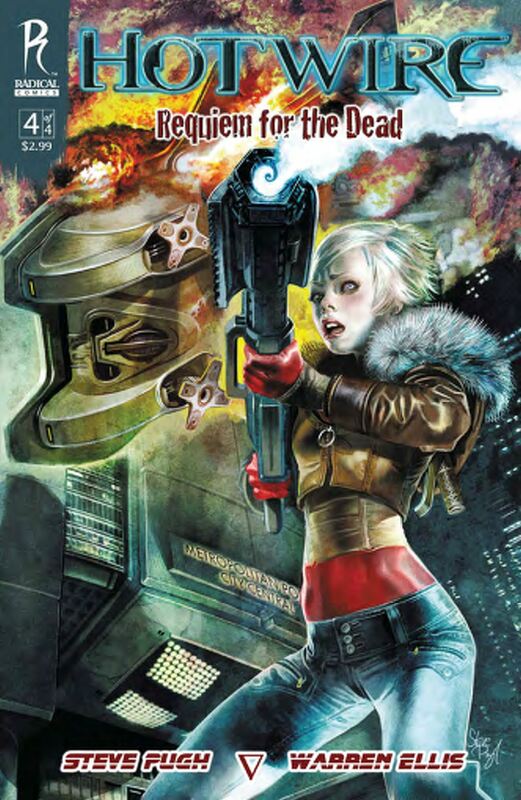 For the uninitiated Hotwire: Requiem for the Dead is one of the best looking books on the stands, but it’s also a good old fashioned adventure to boot. You don’t really see stories like this any more, but Radical know how to make them. This title, and City of Dust are just two examples of easily accessible series from the publisher that anyone can pick up and be hooked on. They’re streamlined, but not simple, stories without the complications that some of our fave superhero titles can often be bogged down with. So, what’s Hotwire about then? Alice Hotwire is a young cyberpunk English lass in a future London ravaged by “blue lights,” which are like electrical phantasms. Her job, as Detective Exorcist is to track down these resurrected corpses and get rid of them, and her partner Mobey is along for the wild ride. At the same time she discovers a conspiracy looking to use the ghosts as weapons, while the rest of the police force tries to deal with a public riot against police brutality. In the last issue Alice and Mobey were separated at the Motts Island Cemetery while Alice stared at a flood barreling down upon her. Alice meets her unlikely saviour however, and we are given the first glimpse at her upbringing, which reveals her understanding of technology and the tragedy of her parents’ loss. This is a grand finale, with Hotwire and her fellow cops facing not only an angry mob wanting to tear apart a pair of violent detectives, but also the “man” behind the mob – the electronic puppet master. Compared to the previous three issues this is a lot more action packed, but it’s also over a little too quickly. It’s kind of like The Matrix Revolutions as compared to the original. It’s an entreaining tale, but won’t make much sense if this is your first dive into the Hotwire world. Pugh has put everything on to these pages. 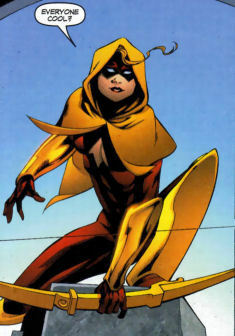 The story was initiated with writer Warren Ellis, but Pugh boldly makes Hotwire his own. I even noticed the unique styles of the lettering and how he displays dialogue. His panel arrangements are chaotic, yet easy to follow and his costume and tech designs are straight from an unmade James Cameron flick. The luscious variety on display really is an eye opener. Pugh makes the art flow and dance across the page like a tattooed ballerina. It’s unexpected, daring and mesmerising. 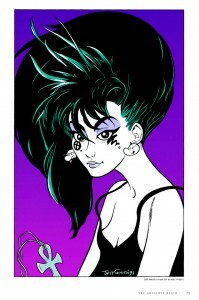 When Radical releases the TPB collecting all 4 issues make sure to put it on your wish list. 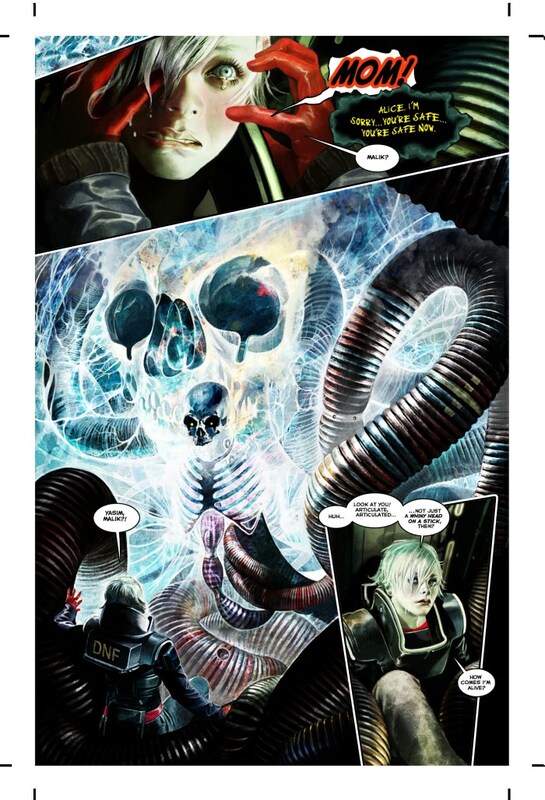 Hotwire has the edginess of 2000AD with the themes of The Matrix and the look of Blade Runner. Those comparisons don’t do it justice, but if you like your sci-fi more William Gibson than Star Trek you’ll be completely satisfied. It’s the kind of series you can pass to your non-comics reading mates to prove a point. And now that it’s all over, I must say a hearty thank you to Steve Pugh. Job well done sir. Hotwire #4 smacks shelves on September 2. Thanks to Broken Frontier (the other site I occasionally write for) you now have a chance to speak to Jeph Loeb, the writer who kciked off Superman/Batman, and is behind the current Hulk series, and so much more. It’s a great opportunity. Details below. Spend Some Quality Time on Broken Frontier! On Wednesday September 2, Broken Frontier will kick off ‘Quality Time’, a new feature where you can get in touch with your favorite creators for a live, one-hour Q&A session. 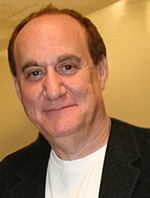 The first guest on ‘Quality Time’ will be legendary writer Jeph Loeb, who will stop by the BF community from 3-4pm Eastern (12pm-1pm Pacific) to interact with you and answer your questions in real time. Get your questions ready and log onto the BF community on Wednesday September 2 at 12pm for the first edition of ‘Quality Time’! If you’re not yet a registered member of the BF community, sign up here to participate. 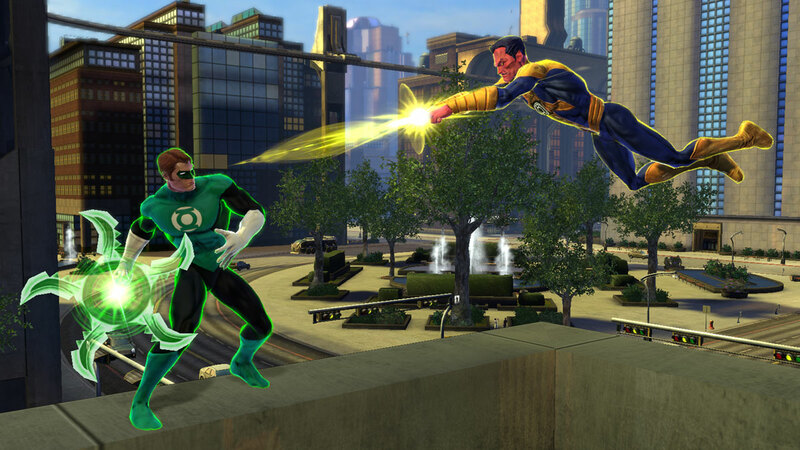 Below are newly revealed pics from Sony of Hal Jordan Green Lantern from the upcoming DC Universe Online game. Here’s the skinny. 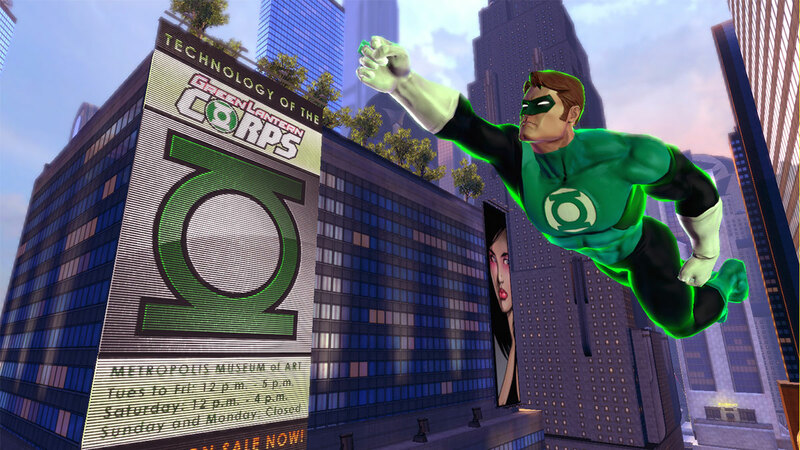 Hal Jordan acquired the power ring and lantern from a dying alien whose spaceship crashed on Earth. The alien’s objective was to find an individual who is “utterly honest and born without fear” all which describes the character of Hal Jordan.